Pokud závodíte v cross-country a od treter očekáváte vynikající tuhost, dokonalý střih, zpracování a nízkou hmotnost, pak zvolte tento model. Cyklistická obuv SCOTT Mtb Rc nabízí velmi pohodlný dvouzónový systém zapínání BOA IP1, s možností úpravy i během jízdy dvěma samostatnými mechanismy. Systém jsme umístili na svrchní část boty, kterou stahuje v poměru 2:1. Asymetrický svršek mikrovlákna a síťoviny se chodidlu velmi dobře přizpůsobuje. Stélka ErgoLogic nabízí možnost nastavení podpory podélné a příčné klenby. Karbonová podešev dosahuje indexu tuhosti 10. The new, multi-operational IP-1 reel platform strikes the ideal balance between precision and convenience by offering pull-to-release functionality for easy on/off and two-way incremental adjustment on-the-fly. Traditional pull-to-release functionality delivers the same easy on/easy off convenience that users know and love. IP-1’s new, two-way incremental adjustment capabilities facilitate easy tightening or tension release mid-ride. 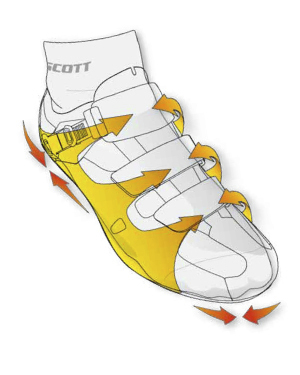 SCOTT has worked with scientist for several years todevelop a concept which integrates maximum comfort and efficiencyvia the outsole. The Power Zone and the Axial Flex are designed tominimize the strain on both the knee and ankle to improve comfortand reduce overuse injuries. 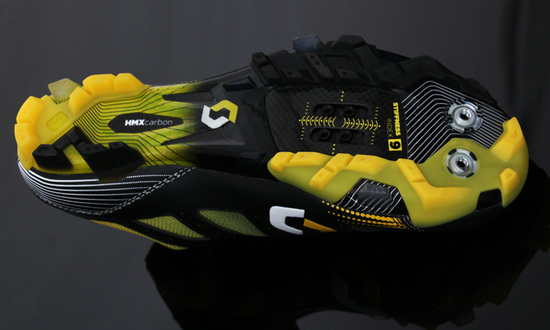 The stiff carbon fiber outsole has a stiffness index of 10. Linear high modulus carbon in a specific 10 ply layup too ptimize sole stiffness from cleat area to heel and minimizeweight yet still allowing some torsional flex fromthe arch to the heel. Featuring a new alignment system to make cleat mounting and placement much easier and more precise.